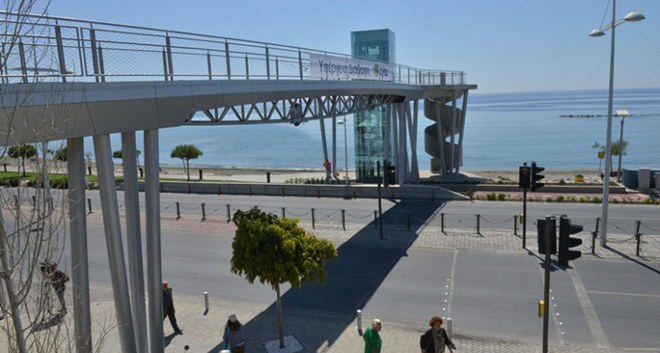 A new pedestrian footbridge located on Limassol’s seafront has been inaugurated, according to local media reports. The bridge, funded by CYTA in the context of its corporate social responsibility, was designed by architect Margarita Danou. According to the Cyprus Mail and Gold News, the footbridge was inaugurated by Limassol Mayor Andreas Christou, Finance Minister Harris Georgiades and CYTA Chairman Christos Patsalides, police and other officials. The structure has been chosen by the Cyprus Architects Association to represent the island with nine other projects in the European competition ‘Mies Van Der Rohe’, the Cyprus Mail reports. Named after German-American architect Ludwig Mies van der Rohe, the biennial award is the most prestigious accolade in European architecture and is awarded to a building completed in the last two years by a European architect.